Fog on the Guadalupe River Trail, which extends from San Francisco Bay to downtown San Jose, near the Amtrak Station. Hi. Greetings from Ventura, CA. I am warm and dry in a Motel 6, after having spent three days cycling here from San Luis Obispo. I got to SLO by train from San Jose, after attending a family celebration in Palo Alto. 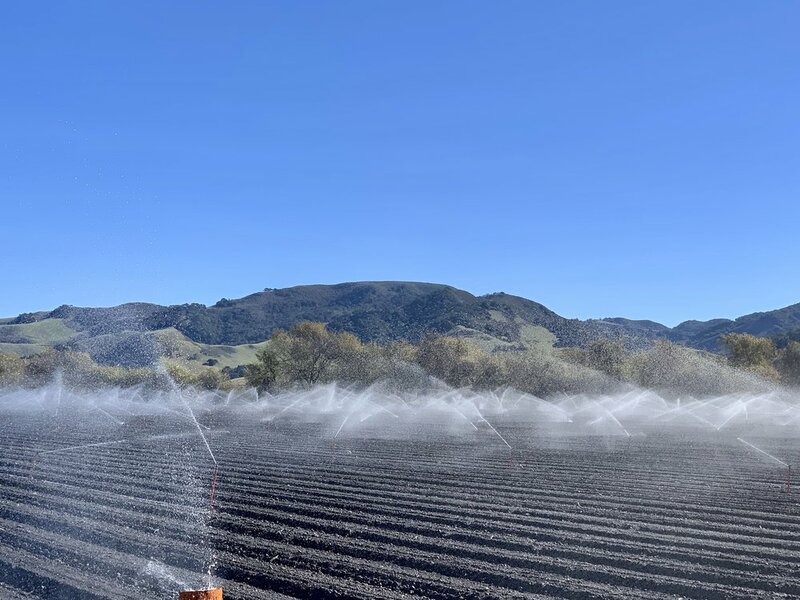 Irrigation on a basil field just north of Lompoc. A stretch of cycling path along CA Highway 101. I am beginning another cycling adventure toward warm and sunny weather, and intend to enjoy the Pacific Coast route as mapped out by the Adventure Cycling Association (ACA) and then the lovely Southern Tier route as far as Tucson (see my archived blog posts on a Southern Tier trip I made a few years back). If time allows, I hope to get as far as Big Bend National Park in Texas, but family matters may intervene. But no matter how far I get, I will be returning to the Pacific Northwest in the spring/summer. This coming summer I am aiming for Alaska. The California coast just south of Santa Barbara. I enjoy loving connections on both generational sides of my life - my parents are still alive, and I stay close to them (trying to be "a phone call away") and my two grandkids (with a third about to arrive) as I split time between cycling in beautiful (or climate stressed) places - which I adore - and New York - which I also adore. Between those activities and my friends in many places, my parents, my kids and my grandkids, I'm a very lucky man. 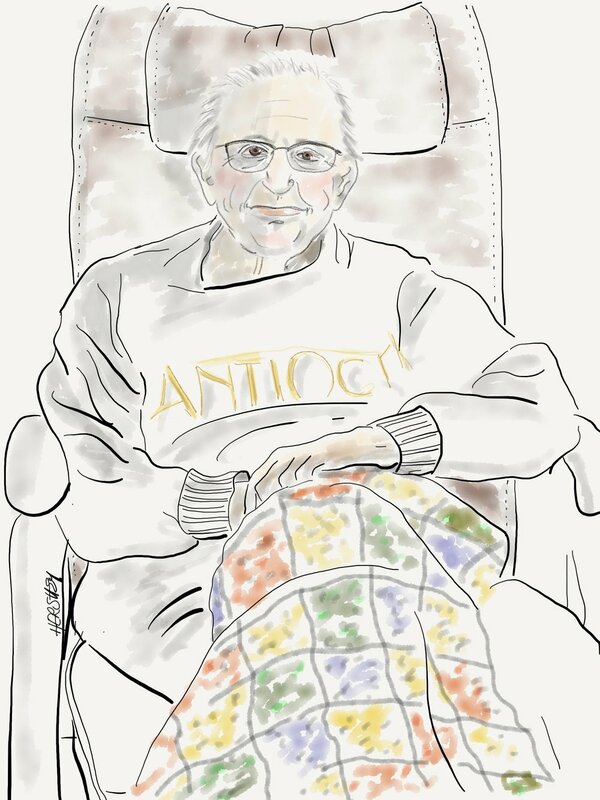 A drawing of my Dad, Kim Chase, by Jennifer Hershey. You can find her work on Instagram under "Deeofo.". On December 30, 2018, my Dad turned 100. When I asked him how he felt, he said, "the same as yesterday." When a neighbor asked him how he managed to live so long, he replied, "Well, I haven't died yet." At a Christmas dinner a few days before, he told someone else who asked a similar question, "it's an accident." A good moment on the bike on my Dad's 100th birthday. So much for formulas. That said, my father has been unusually active all his life. He took up backpacking at 60, and didn't stop until he was 87. He owns a three-wheeled bicycle, which he still rides. 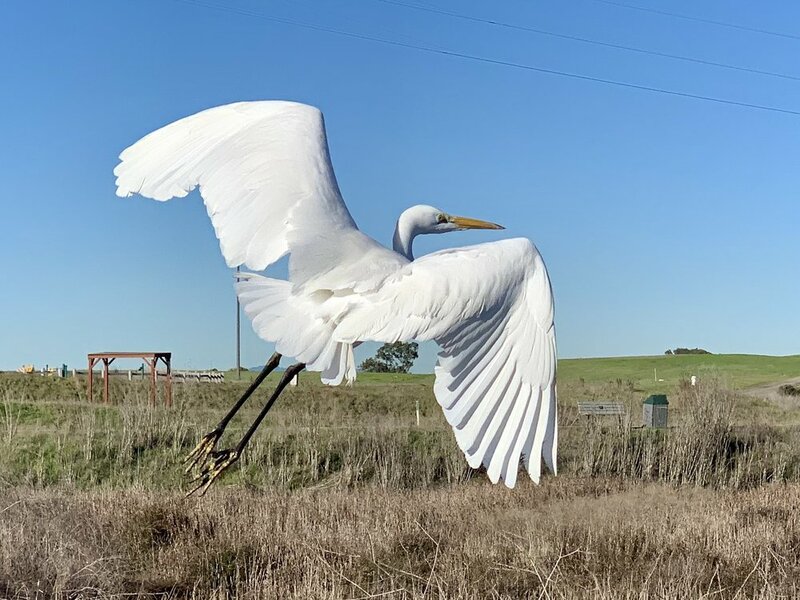 Last week, I took him over the pedestrian bridge that spans highway 101 to the Bay Lands that border the San Francisco Bay (he needs another person to push his bike up the bridge while he walks up with his cane). It's sensationally beautiful at the Bay; a mixture of grasslands, marshes and tidal mud flats teeming with shorebirds. When the tide recedes, the birds dig for food. A Great Blue Heron takes flight. 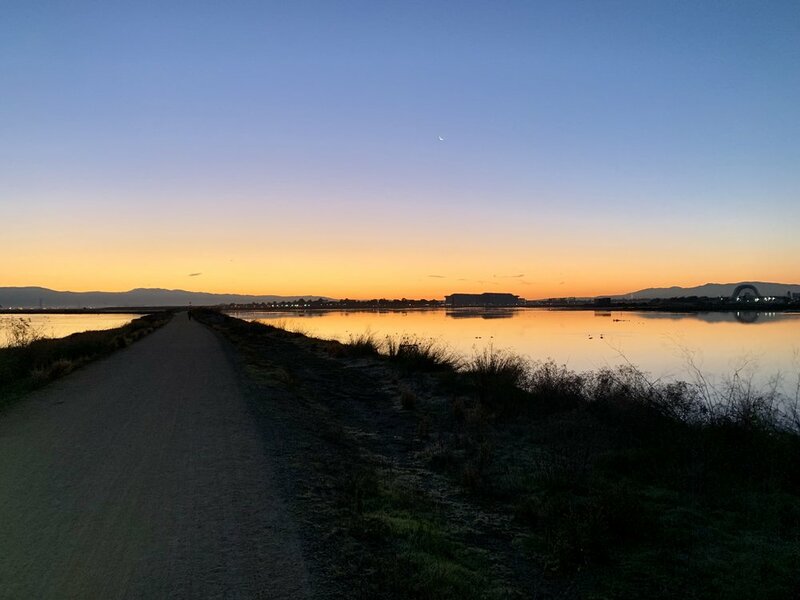 Sunrise on the Bay Area Trail, a bike trail that will eventually follow the perimeter of the entire north and south bays. Whatever his secret is, my father's longevity has been widely celebrated by friends and family. His life has been a rich one, characterized by adventure, lots of hard work, plenty of love, a healthy dose of common sense and good daily practices. He was born just as the "War to end all Wars" (WWI) started, lived through the Great Depression (the family story is that he had only one pair of shoes and set of clothes all through high school), was a naval officer in the South Pacific during WWII, went to Columbia for a Masters degree on the GI bill after the War, then got his Doctorate, had careers as a professor and college administrator, raised three kids and had three wives. Now, near the end of his life, he is witness to the Trump Presidency (according to him, the mayhem is unparalleled), and even more unsettling, the dawn of the age of climate change. I don't know how much my Dad thinks about climate change, although he seems to have no problem understanding it. If he was still driving, I'm sure he would own an electric car (he loves Teslas), and would have installed solar panels on his home. But he's a realist (and an existentialist of the Sartre vintage: "Three o'clock is always too late or too early for anything you want to do. "), so he's never been particularly optimistic about civilization's prospects. A climate stressed place - I took this shot in last month near Redding, CA. It's from the Delta Fire, which took place several weeks after the CARR Fire was contained. Locals refer to it as "the forgotten fire". But my Dad is not a gloomy guy. I'm sure he holds out some form of hope for the future, as we all do. Still, every once in a while he jokes that he's lucky he'll check out before the worst is upon us. And he means it. I think he's right. In some ways, his generation's retirement (with an intact pension, decent healthcare and reasonable wealth) may turn out to have been the pinnacle for the developed world. Subsequent generations may not be able to enjoy the same stability, quality of care and basic prosperity that some in his generation have. We're likely to face global challenges that are unprecedented. I am reminded of the recent IPCC report on climate, which warns us starkly and unequivocally that the scale of the climate crisis will be beyond anything humans have faced before. Climate Change is unique in that its causes and its impacts are global. Greenhouse gas molecules disperse into the atmosphere, equalizing their distribution everywhere. In one way physics makes climate change extremely democratic, although its impacts are neither geographically nor socially equal. Some geographic areas are more vulnerable than others, such as low lying areas near the sea. And some people are more vulnerable, such as those who live in compromised housing, drought stricken or flood prone areas, or those who depend on livelihoods that cannot tolerate significant climatic shifts, such as fishermen or farmers. We have to change our way of life. What an extraordinary challenge. Has this ever been done before? Some people bring up the Marshall plan after the Second World War as an example. I find it an apt but incomplete metaphor. In short, over $12B (in 1946 dollars) were put into rebuilding the industrial economies of Western Europe. But the world needs a plan with a global impact. We need a Marshall plan on steroids. Could it be the Paris Accord? Time will tell. To see my cycling progress over the past days, look here, here, and here.